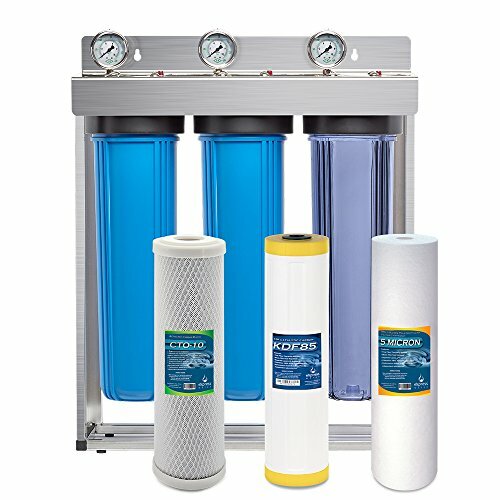 This Whole House Filtration System provides a complete solution for all your water applications. Chlorine free water for indoor and outdoors plants. Get unlimited healthy & delicious drinking water at home - excellent for cooking, making soups, coffee & tea brewing, crystal-clear ice cubes and much more. Protects your family from exposure to unpleasant chlorine, and other chemicals and odors at every outlet leaving you with a healthier hair and skin. Features a high capacity chemical absorption technology that requires less filter changes per gallons filtered. Improves the durability, efficiency & lifespan of your water appliances and saves money on lower energy costs. Dechlorinate drinking water and protect against giardia and other cysts. This easy to use water pressure test gauge with maximum working pressure of 150 PSI easily determines incoming water pressure from your Whole House System. ¼-Inch stem connection. The pressure release button in the filter housings is used for easier cartridge replacement. It is installed in the inlet side of the housing cap. Filter Housing Canister Wrench fits most 1 or 3 stage Whole House filter housings, and systems that use 4.5" x 20" filter cartridges.